The frigates of the Tribal class were constructed to perform three functions, Air Direction, Anti-Aircraft and Anti-Submarine duties. For this reason they were classed as general purpose frigates. When launched they were quite an advanced vessel as they included many "firsts" in their design. The TRIBALS were the first ships to be fitted to carry a helicopter, having a hangar between the aft 4.5" gun and the mortar mk10. They were the first ships to be fitted with the seacat missile system and, most novel at the time, the engines comprised a steam turbine propulsion system (COSAG) and a gas turbine which could be used for additional boost and to get away from a cold start. The single shaft is powered from the combined steam and gas turbines, the former developing 12,500 shp, and the latter developing 7,500 shp. This indicated a top speed of 28 knots. All engine control rooms were air conditioned as was the rest of the ship.. The weapon fit of the class was 2 x 4.5" guns 2 x 4 seacat launch pads (or 2 x 4mm bofors) 1 x 3 barrel mortar mk 10. Some ships were later fitted with 2 x 20mm oerlikons as "junk bashers". 2 x 8 barrelled 3" decoy rocket launchers are also fitted port and starboard. This was the first kit in the range to have MOD 11.This was the decision by DEANS MARINE to scrap all of the kits in the range that are left behind in the development process. The model is then remade as a totally new kit based on a new hull and fittings that bring it up to the standards of the later kits in the range that have had the advantage of the latest construction methods. As in all of our products lots of brass etchings are included for stanchions, ladders The enormous lattice mast and the bedstead radar that was such a notable feature of these ships. The brass etching makes this a simple construction job. The Mod 11 programme will be carried out on all kits in the range throughout the life of the model. 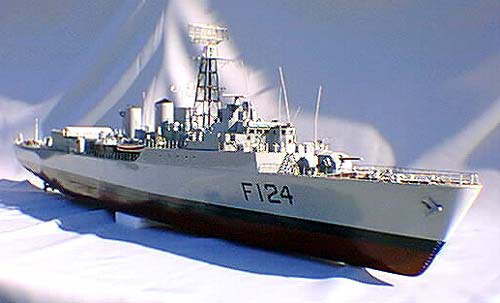 Although this is a large model for a frigate she sails and steers well, being capable of almost "on the spot turns".